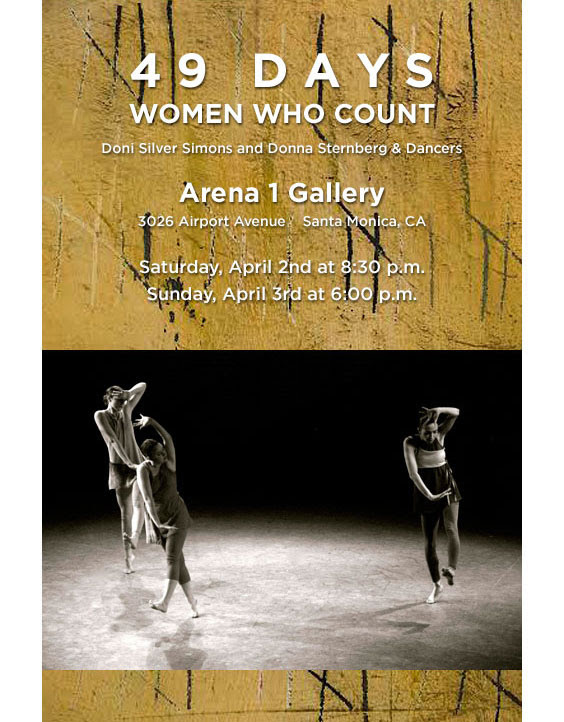 DONI SILVER SIMONS and DONNA STERNBERG & DANCERS present 49 Days: Women Who Count. This work incorporates 42 female performers, a 49-channel soundscape, a visual installation documenting the creation of the work, and a post-performance discussion by the collaborators. The performance explores time, memory, and counting embodied within the roles of ritual and cultural identity. Counting is universal: being conscious of time and marking its passage is innate to mankind. We create calendars and mark off days; we leave our marks on the world and on each other. In 49 Days: Women Who Count, women serve as the “keepers of time.” They are the ones who count. The performers, representing days, move simultaneously, overlapping one another as the performance progresses. Similarly, the sound builds, filling the space as voices and movement become both past and present. Rhythms begin to echo heartbeats, creating a cacophony of sound. 49 Days: Women Who Count shows the evolution of ritualistically marking time. Tickets In advance: $20, general admission; $17, students/seniors. Purchase at: http://49days/bpt.me Tickets at the door: $25, general admission, $20, students/seniors. Doni Silver Simons is a painter, installation and performance artist who lives and works in Los Angeles. She received a Bachelors of Studio Arts from University of Pittsburgh and a Masters of Fine Arts in Drawing from Wayne State University. Her work has been exhibited at the Santa Monica Museum of Art, MOCA, the Detroit Institute of Art, the Wolfson Museum, Jerusalem, MishkanL’Omanut, Ein Harod, Israel, and in galleries throughout the United States. Silver Simons’ work was featured in both the 2013 and 2015 Jerusalem Biennales. Silver Simons is inspired by an insatiable desire to understand and interpret time, memory and identity. Her minimal, yet fastidious, canvases appear like ancient scrolls or calendars that have been unearthed. Quietude and mesmerizing repetitive variations of form, intent and action inform her pieces.